A 54 year old women was scheduled to undergo talocalcaneal fusion due to instability. While her past medical history was unremarkable, she was being treated for Hereditary Angioedema (HAE). She had been diagnosed several years prior and placed on an androgenic steroid (Danazol) every other day. Since being on this therapy she had been asymptomatic with no episodic flare ups. Her only previous episode occurred about 20 years prior before therapy was instituted. This episode required a trip to the ER for swelling in the mouth and throat, but resolved without any need for intubation. She was initially scheduled to be done at a full service hospital. However, her insurance did not allow her to have her procedure at this hospital because the hospital was out of network as part of its business plan. Therefore, the only option was at an ambulatory surgical center. After a discussion with her specialist it was decided to proceed with surgery at the ASC. The tripled her steroid dose and brought with her to the center Icatibant for use in case of an acute attack of angioedema. We planned to do a sciatic nerve and saphenous nerve block for the surgery with mild sedation to avoid instrumentation of the airway. She proceeded to surgery and had an uneventful procedure. HAE is rare. It is characterized by recurrent episodes of well-demarcated angioedema without urticaria, most often affecting the skin or mucosal tissues of the upper respiratory and GI tracts. In most cases, swelling resolves spontaneously in two to four days without treatment. However, fatal asphyxiation from laryngeal edema has occurred. While swelling onset is typically slow (emerging over 3 to 8 hours), case reports of rapid onset laryngeal swelling exist (30 minutes). This disease results from an inherited deficiency or dysfunction of the C1-esterase inhibitor of the classic complement pathway. 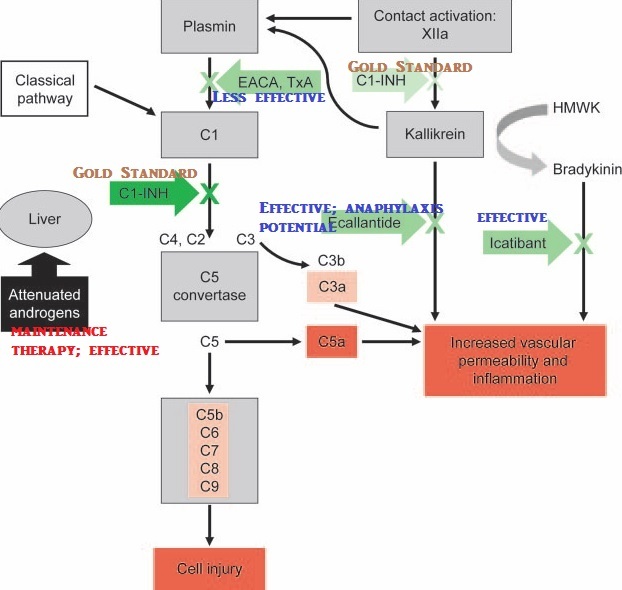 The lack or dysfunction of this inhibitor leads to uncontrolled activation of the classic complement cascade. Trauma, including dental work and surgery, is the most common trigger of HAE. Mutation of the C1E1 gene leads to a dysfunction of deficiency of C1 esterase (C1E1) which is a serine protease inhibitor that blocks the activity of several complement proteases (C1r, C1s, mannose-binding lectin-associated serine protease (MASP 1 and 2), contact-system proteases (kallikrein, factor XII), coagulation protease (factor XI, thrombin) and fibrinolytic system proteases (tissue plasminogen activator, plasmin). Therefore, symptoms are related to the activation of these pathways and the mediators that they generate. In particular, the contact system which generates bradykinin, is the predominant mediator generated resulting in increased vascular permeability, leading to vasodilation, nonvascular smooth muscle contraction, and edema formation. These effects are mediated by the B2 (Bradykinin 2) receptor. There are several types of HAE, type I (85%) is from insufficient C1E1 secreted, type II, (15%) where the C1E1 protein that is secreted is dysfunctional. A third (much less common type) is called estrogen dependent. This type is thought to be related to a mutation in coagulation factor XII which results in kinin production. When encountering a patient that is to be anesthetized with HAE a good history is critical to understand the severity of the disease. Since attacks are often preceded by hours by prodromal symptoms, it is critical to look for these prior to anesthesia in the preoperative interview. In many patients, prodromal symptoms include mood changes, tingling sensations, fatigue or anxiety. While laryngeal edema is the clinical manifestation most concerning to clinicians, HAE can present with intestinal edema leading to abdominal pain and bloating, diarrhea, nausea and/or vomiting. There can also be cutaneous signs of swelling. While trauma is a known cause of attacks in many cases, others attacks occur with no obvious precipitant. Other stimuli that can precipitate an attack include pregnancy, estrogrens, ACE inhibitors, tramadol, menstruation, cold exposure, prolonged sitting or standing and ingestion of certain foods. Also, relevant to perioperative period, stress and anxiety can precipitate attacks. Some studies suggest that the most common cause of attacks in decreasing order are mechanical trauma (52%), mental stress (36%), airway infection (36%) and menses (26%). Because of the rarity of this disease there is no well delineated algorithm for proceeding to surgery when confronting this disease. However, understanding current strategies of treatment can provide a framework to begin with in the perioperative period. Older but established treatments include attenuated adrogens (i.e. stanozolol and danazol), antifibrinolytics and FFP. The attenuated androgens are anabolic corticosteroids that have been shown to decrease the frequency of attacks by >80% in 97% of patients . These act by increasing the liver's production of C1-INH. Attenuated androgens are not used for acute attacks, but for maintenance therapy or prophylaxis. Unfortunately, patients taking this medication over long periods have increased cardiovascular risk due to elevated levels of LDL and decreased HDL levels induced by the androgenic effects. The antifibrinolytics (EACA and Tranexamic acid [TA]) can also be used as maintenance, but are not nearly as effective and are often used only when patients cannot tolerate the side effects of attenuated androgens. The antifibrinolytics are also not very effective for acute attacks. Lastly, FFP has been used to treat acute attacks of HAE with the idea that human plasma contains C1-INH. Unfortuantely, it may require large volumes of FFP to get enough C1-INH into the patient. There is a theoretical risk that an acute attack may be worsened by FFP since it contains high levels of complement proteins. However, in one case review, FFP was shown to provide benefit in most patients. Of course, FFP does also carry the added risk of TRALI, anaphylaxis, and transmission of viral diseases. More effective and newer therapies exist. Most effective is to simply replace the C1-INH proteins not present in the patient's plamsa. C1-INH concentrate has been available since the 1970s in Europe. Today, C1-INH concentrate is considered first line therapy. It wasn't until 2008 that the FDA licensced the first C1-INH concentrate for prophylaxis. For over twenty years Berinert P (purified C1-INH concentrate from human plasma) has shown clinical efficacy and safety in Europe. It is free from risk of transmissible diseases and can be given IV. It was approved in 2009 for treatment of acute attacks by the FDA. Cinryze is another concentrate under investigation also derived from human plasma. Trials have demonstrated that is efficacious for both prophylaxis against HAE attacks as well as treatment of acute attacks. It is licensed by the FDA for routine prophylaxis but not for the treatment of acute attacks. Rhucin is a recombinant C1-INH from the milk of transgenic rabbits. While it has shown efficacy in initial trials, it is still pending approval from the FDA. Recently Icatibant has been shown to be effective in the treatment of acute attacks of HAE. Icatibant (Firazyr), is a synthetic protein that blocks the bradykinin receptor B2 with the same affinity as bradykinin itself. Because HAE is thought to be mediated by increased activity of bradykinin, this receptor is a logical therapeutic target. In the first phase III trial (FAST-1), time to onset of improvement favored Icatibant over placebo (0.8 hr vs. 16.9 hours, P<0 .001="" 12="" 2="" 30="" a="" abdomen.="" acid.="" as="" catibant="" clinically="" delivered="" dose="" for="" hours="" iii="" in="" is="" median="" mg="" n="" nbsp="" p="" phase="" relief="" second="" significant="" sq="" the="" time="" to="" tranexemic="" trial="" usually="" vs.="" was="">Ecallantide (Kalbitor), is a potent and specific inhibitor of plasma kallikrein. It is also given SQ and may also result in a prolonged PT time. In the EDEMA1 trial 72% of patients showed improvement vs. 25% of those who received placebo. While it has received FDA approval for the acute treatment of HAE, it must be administered by a physician with the support needed to manage anaphylaxis. Recently a review was published in A&A  on HAE and the perioperative management of patients with this disease. In brief, recommendations included avoiding airway manipulation if possible, given attenuated androgens starting 2 days prior to the procedure and continue them for at least 2 days after. If the patient is already taking this medication, then their dose should be increased (doubled). If available C1-INH should be administered prior to the procedure (1 hour minimum but can be given up to 24 hours prior). FFP is a secondary option according to this review, however, this is controversial as mentioned above. In patients undergoing particularly invasive procedures requiring an ETT, then in addition to C1-INH, C1-INH levels can be checked and a minimal level of 39% of normal has been recommended . Furthermore, in patients undergoing cardiac surgery with bypass, it has been recommended to use attenuated androgens for 9 to 17 days beforehand if C1-INH are not available or otherwise contraindicated . However, these recommendations were made prior to the availability of newer drugs like Icatibant and Ecallantide. Nevertheless, most case reports having success in preventing an acute attack of HAE in the perioperative period utilized a combination of increased attenuated steroid several days prior and after with C1-INH infusion 1 to 2 hours prior to surgery and again 50 min to several hours after the procedure. This therefore, is the gold standard, but admittedly much more costly. In lieu of C1-INH, for minor surgery, having available Icatibant or Ecallantide seems reasonable. The fall back intervention would be utilization of FFP and/or tranexemic acid. At the end of the day, there is no one single approach to this disease entity. Only after careful History of the disease process, current treatment of the patient, and consideration of the severity of the procedure, can a logical plan be created to minimize the chances of an attack or be prepared to respond appropriately should one occur in the perioperative period. 1. Agostoni A et al. Hereditary and acquired C1-inhibitor deficiency: biological and clinical characteristics in 235 patients. Medicine (Baltimore) 1992:71:206-15. 2. Levy JH et al. Hereditary Angioedema: Current and Emerging Treatment Options. A&A. 2010; 110(5): 1271-9. 3. Spath PJ et al. Quantification of C1-INH functional activities by immunodiffusion assay in plasma of patients with hereditary angioedema-evidence of a functionally critical level of C1-INH concentration. Complement 1984;1: 147-59. 4. Haering JM et al. Cardiopulmonary bypass in hereditary angioedema. Anesth 1993;79:1429-33. Very helpful post! I've been called down to the ED for this once. Poor ventilation and moving down the Airway algorithm fast. Ended up with nasal intubation via fiberoptic bronchoscopy.